The Collective via Ria Gilliani, December 1st, 2018. Blessings Beloved hearts GroundCrew and our family warriors of light . We come today to speak with you as a Collective of (Ascended Masters & Councils of light – Galactics ) within the MotherGod core of the Multiverse . We come To speak to you, Our beautiful family on Terra Nova Gaia . That We ‘ the Galactic Federation Of Worlds & Councils Of Federations Of light , here with the Ashtar Command & Jupiter Command , Consisting of 52 Intergalactic star nations . of our Light Ships that is to take place within all Nows Merging into one cohesive Now. We wish to explain to you , the order of how this sequence of probabilities is to take place within your preceived Now . This must happen our beloveds , as a sequence of events …… That triggers within your collective probable time loops … all interlocking with each other …. ( think of the mechanics of a working clock……. an amalgamation ….Of Time loops , this locking of the timelines’ are locking into the correct Quantum Trajectory as we speak . This we speak of is the collective timeline, that the human collective is now moving onto . ….. and beloveds we can say , ‘ that as a collective , you are doing a Marvellous job of manifesting this timeline in your current Now , by braking down your programming . The next timeline Sequence of events we speak of , ‘ that is now moving into position , before the (Mass Event) is Triggered, is that of What you call (mass arrests) ……. The arrests of our Fallen Brothers and sisters that have fallen from divine grace , that must be removed from all forms of your compartmentalised power structures , They need to be completely removed within your planetary system as well , they must also be removed from the perimeter of the Heliosphere surrounding the quarantine of mother Gaia and your Solar system – That in this Now ‘ And Our fleets of Federation ships (your galactic family members) are currently taken care of this removal . But they will Always’ be given the opportunity to do so . There are Necessary warriors of light and avatars walk-ins that have been appointed to announce NESARA To the collective – these ones we speak of , many you know of ‘ , have already been appointed for this role before incarnating into this realm and many of them are aware of when this will be implemented . You are the Key ‘ beloveds to this awakening- …. You are our Voice, Our Ears , Our Eyes , Our Hearts . You are The conduits … The anchors of light …. You are The voice of the Councils And Federations Of light… you are mighty creators dancing in light . And yes our dear family it will be ( Full disclosure) – We say this again ( Full disclosure) – As This is part of the divine plan and conglomerate prime directive . Part of this Full disclosure will be our presents known to you all , that we are of the light and we are in service to you and your planet (Terra Nova Gaia ) … it we will be known That we are in your sky’s and around your Solar system , and that we are part of a divine Federation of worlds … A conglomerate of councils of light …. Of Galactic Federations and confederations and 52 Star Nations ….. and that we are all One . … One love …. 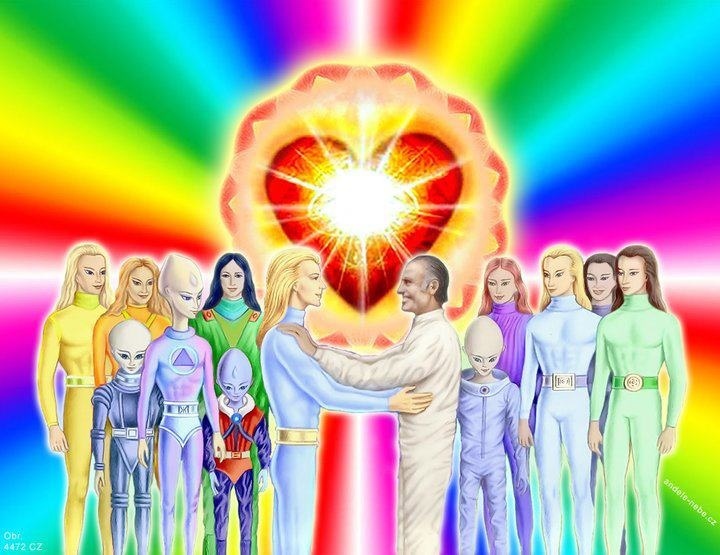 One Family Of light ..and that you dear Ones , you and your mother Gaia will be a part of this galactic Federation of the worlds and Of light ….. You and Terra nova Gaia will be a members of the galactic federations of Light . Now , At this time of the next phase of systematic events …. the vibration and consciousness of the individuals and planet, has raised itself and themselves enough , for us to show (our selfs ) . We Endeavour then to start to uncloak our ships in mass Throughout your planet . Then in time when the light has been implemented into your Mass media ‘ We will Broadcast as a collective over your Internet, TV stations and radio stations – We repeat here …… We will speak as a “collective “ as we are all One . We will then start to show our forms of self to our first wavers …you will be embraced with The highest of Loving embrace ….. We will come in physical higher consciousness forms and physical Avatars ….. some will come in holographic consciousness of pure light ….. All of this at this point is to the ground crew and light warriors , light workers & Starseeds That have fully awaken …… we call you the (first wavers) as they and you have been trained for this in the Higher realms long before you came into human Arcs ….., we will come to you in telepathic communication .. and at that moment You will telepathically given a place and time in your perceived Now as all Nows would of merged by then, of where to meet us , some have back gardens or yards with land ‘ big enough for us to land , the ones that do not have land and gardens will be beamed up from their homes , we can take you from your bedrooms if Necessary , all of this Will be subject to your soul contract . You will be taken to your ships , your home planets, to be greeted by faces That’ have just have passed over the veil , family members ‘ and familiar faces that you recognise, then you will be greeted by your extended galactic family and your ( higher twin flames) to be reunited in Union – ….. you will be given the opportunity to rest for some time in our light Chambers and healing Chambers , there you will receive all your memories back , that was once lost to the 3rd dimensions, these memories will be awakened within your Akashic Matrix record – This is becoming fully consciousness GalacticHumans . when you wake up you will be greeted with love from your family members you have not seen for aeons and aeons. Ohhh just think dear Ones … how wonderful this will be …..
Then you the first wavers will be taken to the one of the greatest motherships of the federations – ( The New Jerusalem ) That has tripled in size recently ready to receive you all home …. The New Jerusalem has the grandest of all ( Halls) we cannot express to you how big our mighty ship is … you simply cannot comprehend the size- in your Human comprehension- however ….. you will know of this , when your memory’s return ‘ from coming into full consciousness … this will be like you never left ….. . This is The Grandest Of All Reunions!!!! This is were you will be greeted from Family members from all over the Multiverse And of the Dimensional layers of existence we operate in ….. We say family here … as we are all One ….. One family…..
At this time – our appointed Science Federation Teams will be clearing your sky’s … your seas …. your lands …. of toxic compounds left over from the lower vibrations …. we will be working and building relationships of love with the first & second wavers involved in working to clear your damaged ego system and return it back to The original (Eden ) … it once was . The second wavers will be received with the same Unconditional love-as the first wavers when they are ready to move to the next stage of There awakening ….. also at this time , many second wavers would have left there Physical Avatars at this moment , as was part of there soul Contacts …. they will be given a new contact to return to Gaia in a new Avatars if they wish as … all is free will ……. Souls that have chosen to stay will be organised into over soul groups – as they have already been Placed in the geographical areas with their soul groups all-ready…. many tho are not aware of this at the moment but as they awaken it will feel like blissful truth to them , and they will instantly know of this inner knowing …. They will be appointed a Oversoul Family members from the first wavers to take them aboard our ships …… Where they will go through the same healing as the first wavers and be greeted by family members who have just Ascended the death way …. as these faces will be familiar to them and then they will be greeted by their galactic family members they have not seen for eones … The second wavers will go to our beautiful ( The Jerusalem) to The Grand Hull , also to be greeted with blissful love from there extended families , and the celebrations will just continue and continue and continue. Beloved hearts know this …… – The love coming from this grand Event will be breathtaking !!! ….. It will be so magnificent to comprehend…. We have seen this in our Now ….. And This beloved family…. This is your future…. Long …..Is … The … Hour ……..
Beloved hearts we understand your frustration……. We know Many of you have felt that this a “insurmountable obstacle” To Over come !!!! “Yes “ long is the hour ….. ……. We tell you this…. beloved hearts …….. Nothing can stop this Prophecy Evolving into the most precious Cosmic Divine Lotus flower in all of creation …..
How much … We are in love with you ……. Do you not feel this beloveds …… We say this again……..
We are in love with you …..
Continue to be the light that you are …. And know we are with you always….